The Control Chapter provides a collection of interesting material concerning the methods and tools for control of electro-mechanical and power electronics systems. Furthermore, we want to inform on a regular base about trends, news and interesting publications and meetings in the area of academic and industrial control approaches for electric devices. If you want to contribute, please contact us. Power electronics is the key technology to control the flow of electrical energy from the source to the load precisely according the requirements of the load. It is responsible for the reliability and stability of the whole power supply infrastructure in Europe from the sources, the energy transmission and distribution up to the huge variety of applications in industry, transportation systems and the home & office appliances (see Position Paper on Energy Efficiency – the Role of Power Electronics – ECPE & EPE). When dealing with large complex projects, it becomes mandatory to take into account the multidisciplinary character of such systems. As an interdisciplinary field, system engineering will for example focus on customer needs early in the development process while considering the complete project. Control Engineering, Industrial Engineering, Organizational Studies, and Project Management are the disciplines considered here. Lille1 / L2EP, supported by the Control chapter of EPE association. works. 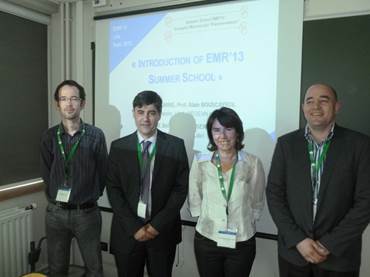 3 ECTS have been delivered by University Lille1 to foreign Master and PhD students. The homepage of the European Power Electronics (EPE) Society with links to the conferences and workshops.